Well it is Saturday and chemo no 4 is done. I can hardly believe that the chemo train has come to an end at last. It is quite strange - I had expected to feel more happy about that but so far just a bit underwhelmed!! I think that it is just a case of getting through the after effects and also I guess for me there is still more to come. I still have 28 doses of radiation to get through and another 8 months of herceptin!! And 5 years of hormone treatment !! However having said all that I will be delighted not to have to sit in the chemo unit for another 7 hour stretch being pumped full of toxic drugs - yeha !!!!!!!!!! There is also the prospect of having my hair grow back and hopefully a bit more energy ! Although apparently for every week of radiation one is to expect a month of fatigue!! 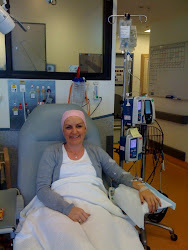 Anyway - so happy to have the chemo done - for sure. It has been such an amazing boost to have my mum here. She is such a blessing and encouragement to us. Not sure how I am going to let her go!! Today I am just recovering , B and mum have planted tomatoes and roses , fed and walked the goats , watered the cows , etc etc.. I so love being here on this farm - I know I have said it before but it is so good for the soul and I really cant imagine living anywhere else!! We have kept in contact with the people we bought the farm from and they are a wonderful couple. L the husband came this week and slashed all around the tricky parts on the property to help us out with all that is going on. Such a kind and generous heart - we are so thankful. Yesterday a lovely friend popped up to drop off a meal - we have been overwhelmed by those who have continued to stand by us on this lengthy road. I will have to brush up on my cooking skills with all the lovely meals we have been getting!! Well I am afraid I am a bit weary today but thought I'd just update that I am alive and kicking - okay maybe not quite kicking yet - more like a shuffle!!!! Oh I must just share a funny tale with you quickly before I conk out!! I have been very spoilt with regular surprise pressies through the post from a very thoughtful friend. 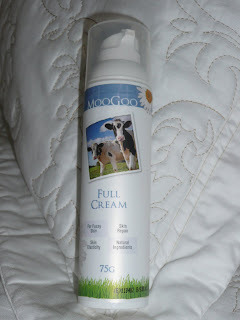 This last gift was a gorgeous bottle of MooGoo moisturiser!! When I was at the radiologist - the girls stayed with my mum. Miss C decided to have some cake - seeing the cream nearby she thought that would go well with her cake. There she was squeezing out my divine cream onto her plate when my mum came to the rescue!! Thank goodness - they both ended up in a fit of giggles as my mum told her that was body cream not fresh cream. When I got home Miss C relayed the story to me giggling once more - she very apologetically said but mum it did say Full cream on it and there was a picture of a cow on it!!! Never a dull moment. Needless to say the Moo Cream is now far from the kitchen counter and safely hidden in my room!!! A friend gave me a card this week that said . Hope is a seed God plants in our hearts to remind us there are better things ahead!! I am thankful for that hope and am surely looking forward to the good things in the days to come! !